Graz, the capital of the district Styria in the south-eastern part of Austria combines tradition and modernism. While strolling through the old town you will walk through romantic alleys which gorgeous stucco on the facades. You see Baroque buildings, and suddenly think you are on another planet when you come across the “Kunsthaus” or Botanical Garden. On the one hand you explore a medieval castle and on the other hand you see a modern building in the river Mur. All styles and times are represented in Graz – no wonder it was designated a UNESCO World Heritage Site in 1999. Take a stroll through "Sporgasse", browse through the nice boutiques, rise early and visit the farmer's market and get some fresh fruit, visit a bakery with its specialties and don't forget your camera when visiting all the sights. A tree covered mountain in the middle of a town? Yes, even a mountain with a castle on top - like in a fairytale. The name "Graz" comes from the Slavic word "gradec" which means "little castle", therefore the Schlossberg gave Graz its name. A funicular brings you to the top of the hill (it's not really a mountain) where there is a lot to see. The Bell Tower with a heavy bell named "Lisl" dates back to the 16th century. There is a glass lift going to the tunnel system of the Schlossberg. It was built in World War II as an air-raid shelter. Today there is an event and exhibition hall. Also on top of the hill, the Clock Tower was built around 1560. It was used as an alarm system when fire broke out. The huge clock face still works, even if electronically since the 20th century. Visit this medieval tower and take a look over the city of Graz. Like a "friendly alien", the "Kunsthaus" is a very modern structure indeed. Connected to the Iron House, one of the first cast-iron buildings on the continent in 1848, the "Kunsthaus" was constructed by British architects Peter Cook and Colin Fournier. The outside looks like a huge bluish bubble. Inside, travelers move to different kinds of exhibitions on the "travelator", a moving belt. 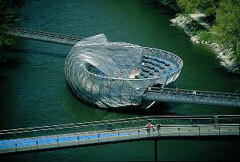 In 2003, the New York artist Vito Acconci designed an exceptional project in the river Mur. It looks like an open shell and serves both as an amphitheater and resting place on one hand and as a trendy café on the other hand. The construction is also a ship where an anchor stabilizes the construction and two footbridges connect it to the river bank. Take a look – it is really a fascinating sight. When the Opera House opened in 1899, it was not really a "music" house but more of a municipal theatre. This changed a lot when the Graz Opera House was selected "Opera House of the Year" in 2000/2001. Again, modernism and tradition are shown at this building. The sculpture "light sword" which stands next to the neo-Baroque Opera House is a steel sculpture which is the symbol of open-mindedness and tolerance. Do not worry if you think you saw a Venice palazzo in Graz. Right in the centre, there is a building which looks like an Italian palace. It houses the Styria parliament. Take a look at the courtyard which is in the Renaissance style. Copper gargoyles from the 16th century, a bronze fountain etc - you really think you are in another world. The construction of the Cathedral started in 1438 in the late-Gothic style, then was refurbished in the Baroque style in the late 17th century. One fresco of the Gothic period has been saved - the "Gottesplagenbild" (God's Plagues) which tells of the time when Graz suffered illnesses in 1480. The interior of the church shows Baroque furnishing while the outside of the cathedral looks very plain today. This huge castle with 31 rooms on each floor, 365 windows (you are lucky you don't have to clean them), 24 state rooms with 52 doors and 4 corner towers, was built between 1625 and 1656. The numbers (weeks, days, hours, months, seasons etc) symbolize the architectural program of this palace. In the planet hall, the decoration is also characterized by astronomical symbolism. Nowadays the castle is in the Hands of the Joanneum, the Provincial Museum of Styria. Make sure to come to the Glockenspielplatz at 11am, 3pm or 6pm. Why? The Carillon of Graz chimes three melodies while a wooden couple dances to the sound. Five times a year the melodies are changed by positioning the 800 steel pins on the barrel in a different way. Therefore also locals get enchanted by listening to the alpine folk and yodeling songs or Christmas carols. It is always nice to find green spots in a city. Graz is literally a "green city" with 70 % green spaces. The park surrounds the formerly fortified old town like a belt. Relax on one of the numerous benches, find shade under the giant trees or simply lay on the spacious lawn and read a book. Aliens must have visited Graz - not only the "Kunsthaus" looks like an extra-terrestrial building, but also the Botanical Garden. The structure of the glasshouses (three parabolic cylinders in acrylic glass) allows a light transmission of 98 %. There are four climate zones inside, with temperatures between 8 and 24 centigrade Celsius (46.4 - 75.2 centigrade Fahrenheit) and a humidity of 50 - 80 %. The different houses (cold house, temperate house, succulent house) are combined by wooden gangways and bridges. 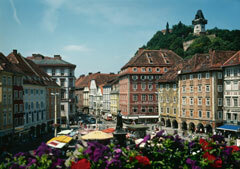 Situated in the district Styria, Graz is approx. 200 km/124 miles from Vienna and 300 km/186 miles from Salzburg, Munich and Budapest. Graz has an international airport (1 ¾ hours from Zurich or 2 ½ hours from Venice) as well as a train station, where international trains stop.